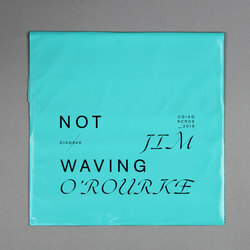 Not Waving / Jim O'Rourke - Side A / Side B. Vinyl LP. Bleep. Alessio Natalizia’s output as Not Waving has long drawn influence from Jim O’Rourke’s oeuvre. As such it must have felt pretty good when O’Rourke offered his services as remixer for some of Not Waving’s back catalogue. The process soon turned far more collaborative, with Natalizia offering O’Rourke unreleased material and encouraging him to have his way with it. O’Rourke pulls Not Waving’s music in strange new directions on Side A/Side B. The former is a long collection of dystopian synth hums that enmesh in a manner similar to Caterina Barbieri’s recent work. Flip the thing over and we get the disorientating electronics malfunctions of ‘Side B’, an intense piece that draws on Popol Vuh. It’s fitting that this meeting of minds has been put out via Diagonal (EVOL, NHK yx Koyxen).